Toll has purchased two new Vawdrey A-double prairie wagon combinations to service its BlueScope Steel operations in Victoria. As the first Performance-Based Standards trailers to join the fleet, they will enhance productivity through significant payload gains. BlueScope operates the largest steelworks in Australia. Located in Port Kembla, New South Wales, the facility produces around three million tonnes of slab, hot rolled coil and plate steel products each year. Coordinating the transportation of such high volumes of steel around the country is a mammoth task that requires high levels of efficiency and consistency. BlueScope contracts Toll to manage and coordinate its logistics operations across its national supply chain. This partnership involves Toll managers based at BlueScope production sites in Port Kembla and Hastings in Victoria to ensure transport operations are carried out to the highest service standard. Toll runs a fleet of over 20 company-owned B-doubles in Port Kembla; and 12 company-owned B-doubles and two A-doubles in Hastings; and employs numerous full rig contractors and hauliers, to transport steel across BlueScope’s national supply chain. Business Manager for BlueScope in Hastings, David Hastings, joined Toll 12 years ago. He worked with trailer manufacturer, Vawdrey, to develop a solution that would offer increased efficiency in the company’s bulk steel coil operations. This resulted in the purchase of two Vawdrey 30 metre A-double prairie wagon combinations running under Performance-Based Standards (PBS). 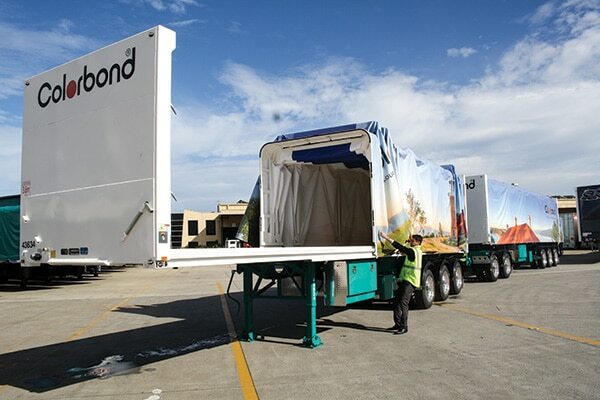 “Toll has been working with Vawdrey for several years and the majority of the BlueScope fleet in Victoria and New South Wales is made up of Vawdrey trailers. Vawdrey worked closely with us to design the prairie wagon trailers we needed. Reliability, lighter tare weight and greater payload have all come into it,” explains David. 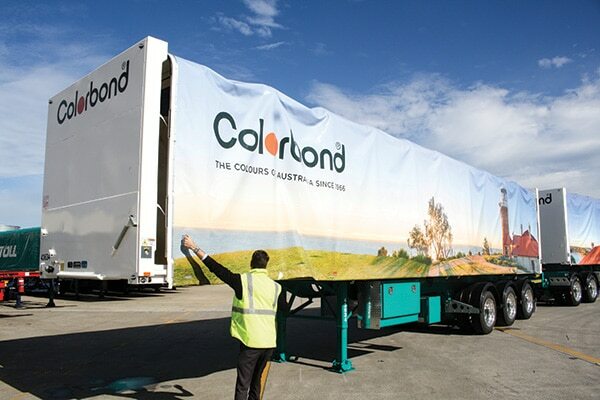 In addition to Vawdrey’s strong relationship with Toll, the trailer manufacturer also has a long-standing relationship with BlueScope. Proudly Australian owned and operated, Vawdrey is passionate about sourcing quality Australian materials, and only uses Australian made steel on all of its trailers. Vawdrey’s relationship with BlueScope has remained strong for over 43 years, starting when company founder Mick Vawdrey began buying steel from the business – known as Steelmark back then – to produce his range of trailers. The prairie wagon design of Toll’s latest A-doubles means that the entire side and roof of the trailer can be rolled back, offering greater access when loading and unloading. “The whole idea of using prairie wagons is to allow clear floor access so the trailers can be loaded and unloaded by crane. We load out of two warehouses – one has vertical coils that can be loaded by forklift, but the other has horizontal coils which need to be loaded by crane. We don’t use flat tops because we are transporting a critical dry product. The entire fleet is made up of prairie wagons,” David adds. Vawdrey has incorporated different locking mechanisms into the design of the prairie wagon curtain to simplify and speed up the process of opening and closing them. The trailers also feature a lightweight chassis construction and use lightweight Hendrickson suspension, which add to the savings in overall tare weight. 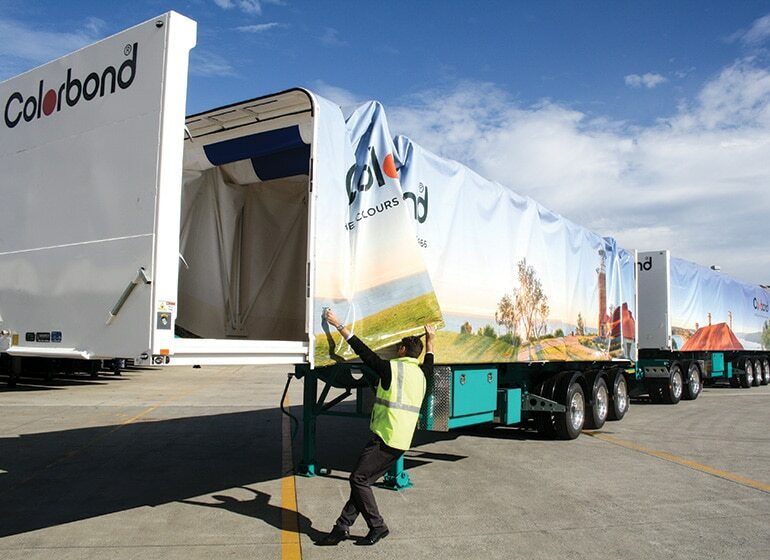 The new trailer combinations will be based in Hastings to service freight movements in the Melbourne basin. Previously, B-doubles were used to service this task, however the new A-doubles will offer increased capabilities and higher payloads, representing gains of 8-10 tonne per trip. These are the first combinations in the BlueScope fleet that will operate under PBS. Fast Fact: Australian steel company BlueScope was started in 1915 and is now the third largest manufacturer of painted and coated steel products in the world. Its global network includes over 100 facilities in 17 countries, and the business employs approximately 14,000 people.